At our church council, we reflected again on our journey together with the Lord, we used the words of that favourite hymn “One more step along the world I go” (H&P 746) and we reflected that wherever we are on our journey with the Lord, the encouragement is that He journeys with us. I think we are working well together and we have a good stewards team. We need to continue to grow the team, and look at succession planning. John & Janet offered to Steward for 2 years, so we need to start thinking of who we grow to replace them in 2016. We also need a few more pastoral visitors as some of our existing pastoral visitors have stood down after many years’ service. Also we need to consider how we replace John Harrison as Chair of the Property and Finance Committee. The stewards are planning an away day as an opportunity to review and plan for our continued future. We look forward to our 80th Anniversary in November, our grand anniversary meal and the visit of Rev Martyn Turner, and we are also planning an Open Day on the Saturday to showcase what we as a church offer to the community. The Messy Church team feel that we are ready to trial running Messy church on a monthly basis from January, and we are going for the last Sunday of the month. This will give us continuity, and we can keep on inviting people back for the last Sunday of the month, and print our literature accordingly. Keep praying for Messy church an all our initiatives as we try to grow our church fellowship. We have seen an increase in the number of Baptisms we are holding, and whereas there are some reservations amongst us all about future attendance, it has been pleasing to hear the volume of those that have joined in with “we believe…..” We rejoice with Elizabeth and Scott Plowman at the birth of their second daughter Eva Alice and we look forward to another church family baptism. We also rejoice with Zoran and Rev Elizabeth following the birth of their baby Stephanie. In these next 6 month, I am going to have to ask for your continued patience with me, as I may not be as available as I have been; whilst I look after Canvey during Rev Elizabeth’s maternity leave. Harvest is over for another year and I wish to thank all those who helped to make the church look so beautiful – those who donated gifts and money; the flower arrangers and those who came on Monday to dismantle the arrangements and deliver the flowers and food. To enable members of the congregation to send personal Christmas Cards to other people within the church the usual post box will be in the Welcome Area from the 30 November. The cards will be available for collection on the morning of the 21 December. Please note that only cards that can be collected by the recipient should be put in the box. granddaughter for Keith and Pat Norman. Joyce Tyler has new twin greatgrandsons, Joshua David and Adam James, born to Steven and Sam on 29th September. Welcome to all the new babies. Best wishes to Elsie McKinnon as she recovers from a recent fall. Please continue to pray for Mary Lewis as she comes to the end of her first course of treatment; also for Margaret Purves, continuing to receive chemotherapy. The death has occurred of Lily Hilton, who with her husband Harry had a long association with this church before moving up north. Sympathy is sent to her family. 6 November ":First World War:"
13 November Theatre Outing ~ "Sister Act"
20 November "Gospel Grooves" ~ Clive Lewis. 27 November Rev. Anthony Windsor. All friends most welcome to join us on Thursdays at 8:p.m.
Books, cards, Bring & Buy. Over the weekend of 22nd and 23rd November, we at Rayleigh Methodist Church are celebrating 80 years on our current site, and 130 years of Methodism in Rayleigh. We want this to be a special occasion for the whole church family, so on the Saturday morning, from 10-12 a.m. we will be inviting everyone who has connections with us to come to our special Open Church. This will include all church organisations and people who are connected to the church through long term lettings. There will be a coffee morning, and we hope that everyone connected with the church will put on a display of their work, so that we will all have a better idea of the different activities that make up the family of Rayleigh Methodist Church. We are also hoping to attract people from the community at large to come and see what goes on in our church. On Saturday 22 November we are celebrating the Church’s 80th Anniversary with a 4 course gourmet dinner at 7 for 7.30pm. Tickets priced at £10 are available from Sheila Allen. Advent Day on Tuesday 9 December 2014 at Highlands Methodist Church, starting at 10:30 am. Act of Worship in afternoon. Eighty years ago this month, on 30th November 1934, to be precise, a scheduled express train, pulled by a locomotive called the ‘Flying Scotsman’, broke a notable rail-speed record. On its journey northwards from London Kings Cross to Edinburgh Waverley it touched 100 miles per hour. I was a bit too young to see that journey, but a few years later, perched after school on a wooden fence just north of Wood Green station, I would often watch spellbound with my friends as the same train sped past, a mere matter of yards away from us, belching steam and deafening us with the roar of its wheels and engine. Sometimes the driver or the fireman would wave to us, but the privileged ones in the dining car, already addressing their late cooked breakfast, were oblivious of our envy. It was a highlight of our Saturdays and an unforgettable memory. It has, of course, gone on. We can now travel vast distances by air, getting from London to New York in not much longer than the ‘Flying Scotsman’ took to get to Edinburgh. We move heaven and earth to save five minutes (and often pay a small fortune for it, as well) and then wonder what to do with the time we’ve ‘saved’. Since those exciting days back in the thirties, I wonder what our obsession with speed has truly added to the sum total of human happiness? Yet I have to admit that there was something special about that great clanging monster, just as there was about the elegant sight of Concorde on its supersonic way across the Atlantic - and I must also admit I would never choose a slower train for a journey. I suppose it’s not so much ‘saving time’ that matters, as what we do with it when we’ve saved it. Now there’s a thought for the 80th anniversary of a land-speed record! Also 40 years ago:- on 20th Nov 1974 that British politician John Stonehouse faked his death by leaving a pile of clothing on a beach in Miami, Florida. He was found alive and well in Australia on 24th Dec, and was arrested on suspicion of being Lord Lucan. And 30 years ago:- on 12th Nov 1984 that the British Government announced that English pound notes would no longer be printed from the end of 1984 and would cease to be legal tender from the end of 1985. And 20 years ago:- on 14th Nov 1994 that the first fare-paying passengers travelled through the Channel Tunnel linking England and France. Also 20 years ago:- on 19th Nov 1994 that the first National Lottery draw was held in Britain. The Bible Society relates how, in 1917, two bullets destined for Private Bush’s chest were stopped by a Bible he kept in his breast pocket. He was knocked off his feet and into a shell hole at Ypres, Belgium, and although he was injured, he survived and lived to the ripe old age of 76. Flat pack boxes, leaflets, details of warehouse opening times and knitting patterns are available in the Welcome Area. If you are able to help at the warehouse, (the Cricket Pavilion in Rawreth Lane) please take a flyer with all the relevant information. Filled boxes can be brought to the church on the 2nd, 9th, 16th and 23rd November. The lorry will be collecting the shoeboxes and departing for Roumania on Sat 29th Nov. so we will not have our boxes on display for our Shoebox Thanksgiving Service on Sun 30th Nov.at 10.45am. However we can pray that they will have a safe journey to their destination. We are aiming for 70 boxes this year, so please help us reach our target. Just a note to say a big thank you for the beautiful flowers which Elaine and John delivered from the harvest floral displays they are really lovely and cheered us both up no end. It's been a hard struggle but I'm hoping my treatment finishes in January and I really hope we will both be able to come back to meetings at the Women's Fellowship and Sunday worship. God bless you and thank you again. When our grandparents, uncles, aunties fought for you and me. To fight for freedom and for peace that all men would be free. The mangled bodies of their friends such sights have never been seen before. Many of their friends lying wounded or in amongst the dead. The awful sights they must have seen were more than they could bear. and most on foreign shores. They gave their all that we might live in peace for ever more. 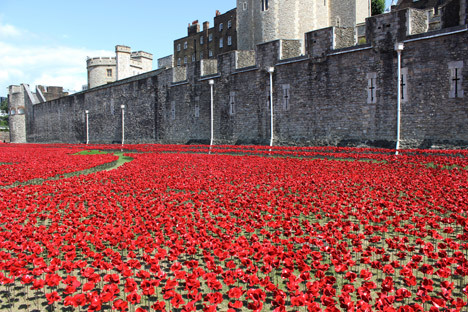 We must remember the sacrifices made by every man and on 11 November we should remember those who died. The ones who gave the greatest sacrifice of all and wear our poppies with Pride. The season of Advent starts on the 30th November and as usual we will be lighting our Advent candles. However this year you will notice that the colours are different. On researching the meaning of the different colours of the candles I came across the following comments. As with many long-standing customs, the origins of the Advent wreath are somewhat debated. Some histories of the Advent Wreath say that Christians simply adapted an even earlier custom from pre-Christian Germanic tribes and even as far back as ancient Roman times. Supposedly, then, these pagan people tried to break the darkness of winter with candles and invoke the sun god to return with the warmth and light of spring. In addition, the evergreen wreath would remind them that there is still life and the circle of time would again come back to spring. According to this viewpoint, Christians later placed new and Biblical meaning to the old customs. Now the candles pointed to Jesus, the Light of the world (John 3: 17-21) The evergreen wreath now reminds believers that our Saviour God grants new and everlasting life in Jesus. Martin Luther may also have used the wreath as a Christian education device and thus popularised it and the Advent wreath in its present form started in Germany as a Lutheran family custom. Historically, the candles have no more meaning than a countdown and traditionally the candles used were purple, because in antiquity, purple dye was very expensive and it was the colour of royalty, so we use purple for advent because it is the season of the coming of the King. Each Candle represents an aspect of the spiritual preparation for the celebration of the birth of our Lord, Jesus Christ. Finally I came across the following origin of the Pink candle written by a Methodist. The Pink candle is becoming more and more popular, but it has a strange origin. Long ago the pope had the custom of giving someone a rose on the fifth Sunday in Lent. This led the Roman Catholic clergy to wear rose-coloured vestments on that Sunday. The effect was to give some relief to the solemnity of Lent, so this was a very popular custom. Originally Advent was a solemn fast in preparation for Christmas, so the custom was extended to the third Sunday in Advent to liven it up a little bit too. Somewhere in there the third candle of the Advent wreath turned Pink. Meanwhile Advent is no longer solemn and the pope no longer has the custom of giving out roses. It is kind of odd to think a Methodist would put a Pink candle in a Lutheran Advent wreath because the pope used to have the custom of giving out roses, but sometimes we’re a little more ecumenical than we realise! Are we? I sincerely hope so. Communication is one of the priorities that your Vestry Team has identified as requiring improvement. We hope that you have seen some improvement during the past 6 months. Communication is however a two way process and requires members of the congregation as a whole to make the Vestry team aware of any concerns they may have. If we are not made aware of any issues we are not able to address them. Hopefully there might also be some positive feedback as well. It is no good having conversations with one another and expecting action to be taken, it will not happen. We are not able to please all the people all the time and there has to be give and take on both sides. We all need to adapt to change for the church to grow but please let us have your honest and thoughtful views. Do you have grandchildren? Then this winter, during those long dark days, why not spend some time putting together a sort of scrapbook of memories to pass on to them? Things you might include could be: where you lived when you were a child; what your school was like, what games you most enjoyed, who your best buddies were, what pets you had, what your first job was, and how you met your partner. What was your first car, and where was your first home as an adult? Add a selection of photographs that you have from the past. Websites like www.blurb.co.uk has lots of ideas to help you create your memory book.